Phil Anselmo has quite a back catalogue and since his days with Pantera has proven his front man qualities over and over again with exquisite acts and the crème de la crème of what the NOLA scene and generally the South of the United States has to offer. 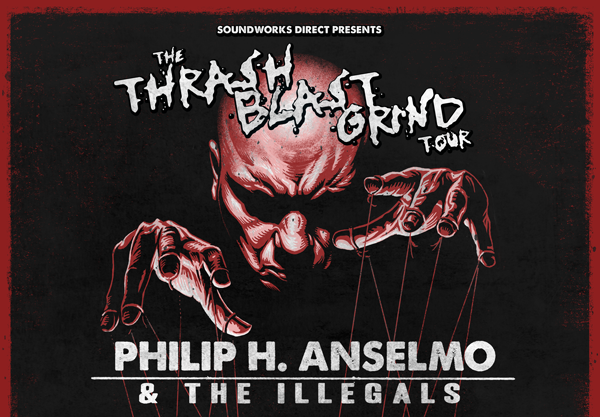 Phil H. Anselmo & The Illegals is yet another incarnation comprised of (ex-)members of some of the best of the never not incestuous Louisiana scene. So far for the commonalities. On record I found their emissions a bit amiss as it seemed to lack structure with its irregular rhythms and leaning heavily towards grind territory, including ultra-low death metal growls courtesy of Anselmo and him at times employing a range of screaming styles within the confines of individual songs. In a live environment it proved to be a different experience as the band manifests itself in a powerful dissonant onslaught of manic chaos worlds apart from what went down under the umbrella of Down or Superjoint. A well-calibrated melange of death, thrash, and grind was unleashed with the sold-out crowd being willingly pummelled by a set that culminated in an enthusiastically received Pantera medley in honour of his fallen brothers. Anselmo was in fine form, vocal delivery wise on top of his game and I doubt that anyone who remotely likes his former incarnations would be disappointed by him holding court with the Illegals - a band that is difficult to top in terms of intensity and pithiness, despite this endeavour being informed by a far simpler and more aggressive approach that his other bands and a focus on the foundation of unbridled anger in its purest form.